Most people love cookies and chocolate chip seems to be a favorite. I can never resist homemade cookies because the smell of them freshly baked smells so good! However, I strive to be healthy and am making changes in my diet so my body can be the best it can be. Even though I have a weakness for chocolate and for cookies, there is a way to use these two items and make it into a healthy recipe that the whole family can enjoy! Mix melted butter, brown sugar, coconut and eggs. Add water and mix well. In a separate bowl, stir flour, baking soda and baking powder. Add the flour mixture to the first bowl and add the melted chocolate squares and coconut. Place rounded teaspoons on an ungreased cookie sheet. For soft cookies, bake for 8 minutes. For crispy ones, bake for 10 minutes. 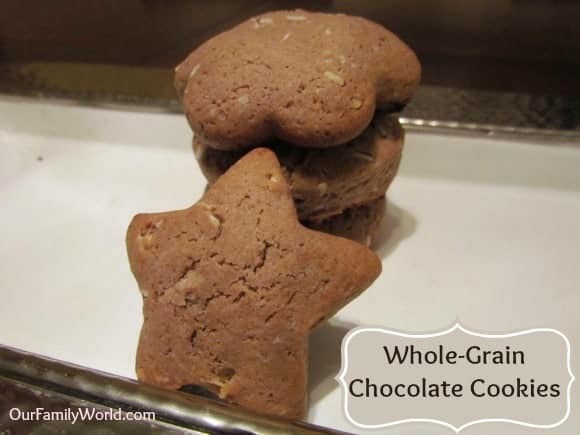 This healthy recipe for Whole Wheat Chocolate Cookies makes a batch of approximately two dozen cookies. I prefer mine to be warm and soft so the chocolate melts in my mouth. Now that you know how to make this healthy recipe, how about some interesting facts about cookies! Did you know that the first cookie was made in Persia in 7 A.D.? Historians say that they are more like cookie cakes, but I find this pretty fascinating! It is no surprise that chocolate chip cookies are the most popular cookie in the United States, but did you know that they were created by accident? Ruth Wakefield was baking one day in 1933 and discovered she was out of nuts. She found some chocolate and threw it in the batch to see how it came out. We are certainly glad she experimented instead of throwing the batter away! Surveys show that the average person will eat 35,000 cookies in their lifetime. My, that is a lot! An even better reason to turn those cookies into healthier versions! For one last fun fact, you can tell your kids that the Cookie Monster from Sesame Street was originally named Sid. I think he looks more like a Cookie Monster than a Sid. What do you think? What is your favorite cookie and have you tried baking a healthy recipe for cookies to satisfy your sweet tooth? I am always looking for sneaky, healthy options for cookies. Thanks for the recipe! I’m always on the look out for healthier school snacks for my children. These look like a simple, yummy treat which I’ll feel good about them having. Hooray for whole wheat flour! I’ve also been experimenting with almond flour. So much better for you than white flour. They look delicious and I know my son will love them because of the coconut! I loe the healthy twist and using whole wheat flour in the recipe! It probably also helps you feel more satisfied with just one or two instead of wanting to eat the entire cookie sheet! I want to try these! I often try to find healthy desserts. This is an interesting recipe. I’m glad it smelled so good baking. I saw these go by in SU the other day!!! YUM!! Wow – these look delicious and sound great too! Thanks so much for sharing the recipe! Thanks Shannon! They are really great! The coconut are a great addition!! I love the healthy options for sweets!